A newly published study by Harvard Law School and Tel-Aviv University examined 18 years of political donations from CEOs of S&P 1500 companies. 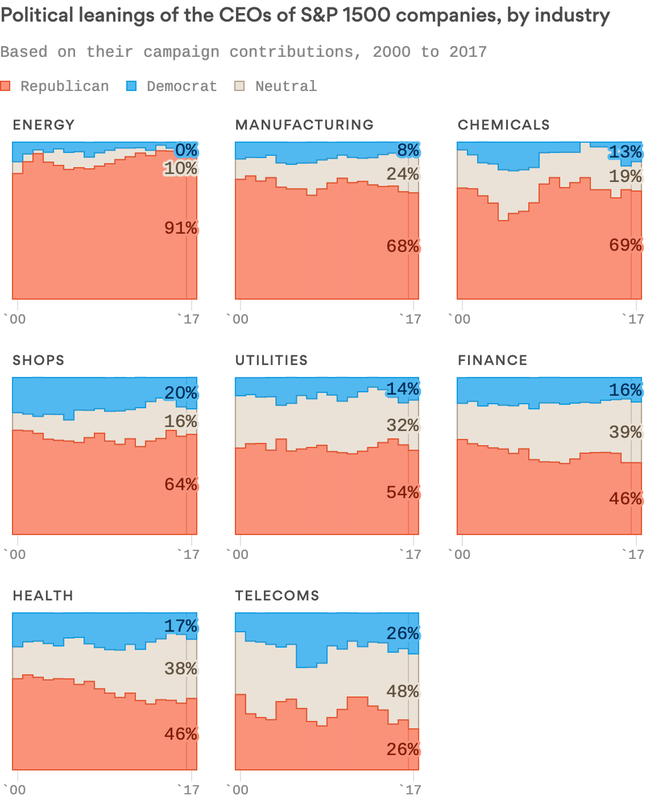 The study, as Axios reported, found that “the chief executives of America’s largest public companies are more than twice as likely to lean Republican in their campaign contributions than to favor Democrats.” When it comes to the oil and gas industry, nearly 90% of CEOs favor Republicans over Democrats which might explain why the Republican party has found few political consequences for shifting their stance on climate change in the past two decades from debating how to address it to flat out denying the underlying science. CEOs of public companies preside over a significant fraction of the American economy and wield substantial power over a majority of the assets held by business firms. Their power over corporate resources, as well as their significant stature and prestige in the economic system, enable public-company CEOs to have significant influence over policy and political decisions. Republican CEOs are about three times more numerous than Democratic CEOs: Republican CEOs (so defined) are 57.7% of the whole sample, while Democratic CEOs are only 18.4%. Why This Matters: Addressing climate change in earnest will likely mean a transition away from fossil fuels and while this will be a business opportunity for the green tech sector, some of America’s biggest companies are in the oil and gas business. CEOs have a profound influence on how their companies spend money and in recent years those companies have given hundreds of millions of dollars to Republican candidates. Those companies bet big and won big especially with the Trump administration and have benefitted from his revised version of NAFTA, plans to expand offshore and Arctic drilling, and the senators that were the biggest proponents of the U.S. withdrawing from the Paris Climate Agreement were also the biggest recipients of oil and gas contributions themselves. It’s no secret that powerful lobbies have a lot of sway in Washington (with both parties) but when Sen. Ted Cruz (R-TX and the #1 recipient of oil and gas money in Congress) mocks in his April Fools joke an earnest effort to address climate change, it’s not difficult to imagine his motivation.